The most valuable and significant trades are conducted via voice, and these trader voice communications are rich with insights about the financial ecosystem. That’s why Cloud9 Technologies uses machine learning to transcribe trader voice conversations into metadata with industry leading accuracy. This startup offers a compliant and secure way to extract the power of the oldest and most important form of communication: the voice. AlleyWatch sat down with Cloud 9 President German Soto Sanchez, to discuss the company’s exciting trajectory and latest round of funding. Founded in 2013, this NYC startup has now raised a total of $44M over three rounds. This investment was a Series B round for Cloud9 that was led by Barclays and included JP Morgan and NEX Group. Tell us about the product or service that Cloud9 Technologies offers. The company’s cloud-based platform is the leading purpose-built, end-to-end voice communications solution for institutional traders. Our technology handles millions of voice trader communications per day from a network of over 5K institutional users. 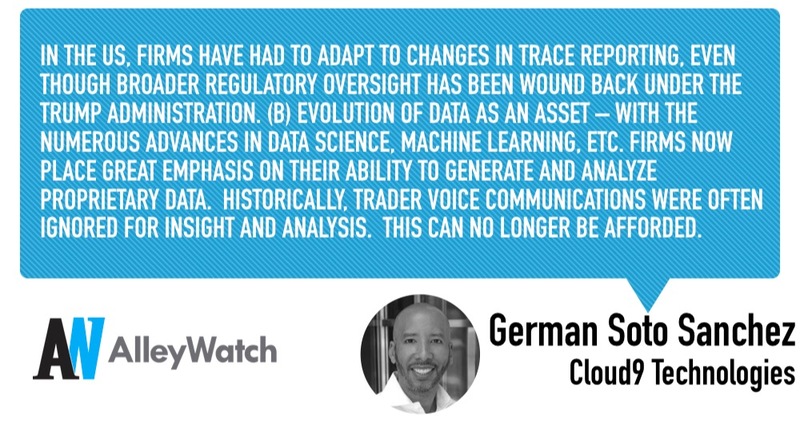 By digitizing the entire institutional trader voice lifecycle and providing an innovative, secure, and compliant means of delivering the associated metadata, Cloud9 enables traders to uncover and seize the historically overlooked value present within their voice trading conversations. What inspired you to start Cloud9 Technologies? Today’s trading desks rely on 30-to-40-year-old expensive and antiquated hardware-based technology. This lack of innovation has resulted in legacy products that have not kept pace with evolving regulatory and business needs. The Cloud9 opportunity was created with the understanding that a new approach to trader voice communications was necessary to address modern-day challenges in a secure, compliant, and efficient manner. This message has resonated well across the industry as there is now broad agreement that the traditional, expensive trading ‘turret’ hardware will eventually be replaced across trading floors by fast, customized, cloud-based trader voice communications technology. How is Cloud9 Technologies different? Our business model and approach to technology are welcomed changes to the trader voice industry. Cloud9’s voice communications platform is a SaaS application (versus current CapEx heavy approach) which costs up to 40% less than existing legacy solutions while providing better features and unique, previously unavailable critical metadata that enables next-generation analytics in areas such as (a) surveillance/compliance, (b) business insight and (c) trader workflow enhancement. 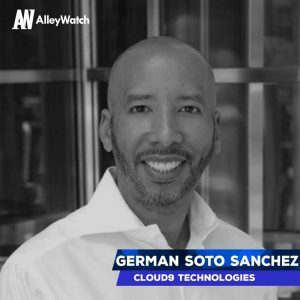 What market does Cloud9 Technologies target and how big is it? 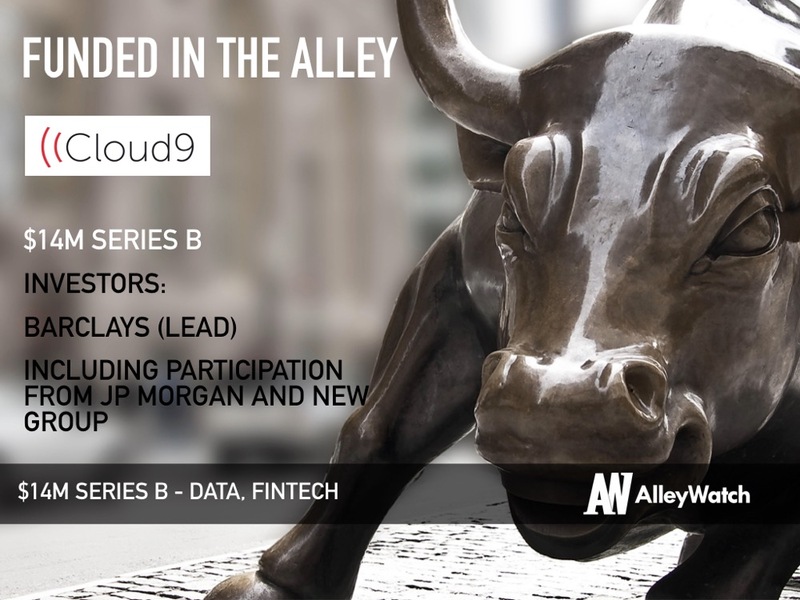 Cloud9 provides trader voice communications services for an array of financial institutions, from large global banks to interdealer brokers and even small trading shops; this includes buy-side firms such as hedge funds and other investment funds. Trader voice communications is the dominant method for traders to interact across several asset classes such as commodities, fixed income, and credit. You will also find voice trading in asset classes perceived to be heavily electronic such as equities – with the key factor being that the most valuable trades are often conducted via voice. The trader voice market is composed of hundreds of thousands of traders supported by two to three times that amount in middle and back office support functions and can also include other regulated users such as asset managers and private bankers. Since we last spoke, what changes have you seen in your industry that you have had to adapt to? Our business was purpose-built to address and adapt to a number of industry-wide changes which we felt were unaddressed by legacy providers. Two specific examples of such changes include: (a) Regulatory change – In Europe, firms have had to comply with all the guidelines under MiFID II, while also having to absorb changes in Basel III, AIFMD, and the current transition from LIBOR to SOFR and the upcoming implementation of SFTR. In the US, firms have had to adapt to changes in TRACE reporting, even though broader regulatory oversight has been wound back under the Trump administration. (b) Evolution of Data as an asset – with the numerous advances in data science, machine learning, etc. firms now place great emphasis on their ability to generate and analyze proprietary data. Historically, trader voice communications were often ignored for insight and analysis. This can no longer be afforded. Cloud9 delivers long overdue innovation in the trader voice space. Banks realize that specialized providers like Cloud9 are more valuable than ever, especially when it comes to issues like data capture and analysis. Cloud9’s ability to generate and deliver metadata that was never before available is crucial for the generation of unique business insight and for better risk management (as regulatory bodies like ESMA, the FCA, FINRA and the SEC are putting greater emphasis and scrutiny on data reporting). The proceeds from our funding will enable us to further develop the feature set of our communications platform while also expanding our data generation and delivery capabilities. This is our focus over the next six months. The key is to make sure that whatever your solution is and whatever part of the market you’re servicing, there is a meaningful market structure problem that you’re addressing head-on with your innovation. Such an assessment doesn’t need to happen in a bubble. 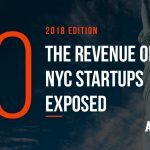 The NYC area is fantastic for this as there are so many firms and people with the necessary expertise and willingness to provide feedback on a fintech company’s value proposition. We’re in a state where the level of fintech innovation and funding are very high, so the bar has to be raised and what you’re delivering has to stand out. In addition to the above milestones, we envision our company growing its network base of users and promoting interoperability that facilitates a tighter coupling of our solution with the broader trader ecosystem. Overall, there are many exciting opportunities for us to interact and potentially integrate with other services/applications in a manner that will create value for our customers. We are just scratching the surface and are truly excited by the possibilities. If I am at a rooftop bar, that is likely work-related or someone else dragged me there. My kind of place just needs a really good wine list.